My mom and I were driving around the back roads of Hill City and stopped to take a picture of a very scary house. There were no cars, and the windows were empty and mostly covered up with old curtains. I was already freaked out, and we took three pictures and continued on past the house. I took a look at the pictures afterwards and saw a woman-like figure standing in the window. My mom has the other two images on her computer but I have this one. I see 4 images in the window on the far right (2 images of faces in the top pane, 2 full-bodied images of perhaps children) in the bottom pane.). 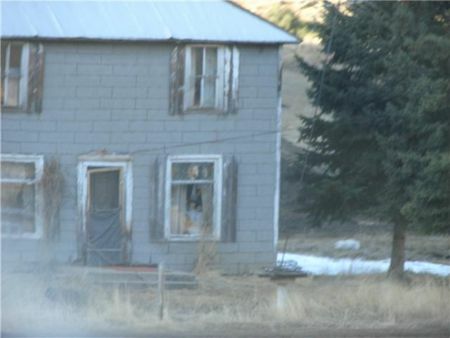 That is Addie Camp and abandoned mining town; the house was once the general store.